I installed the 14.11.1 and tested som playing in BF4 with crossfire & Mantle enabled. After playing exactly 8 Minutes in Match Goldmud Railway, my System Memory goes up to 14 GB. The capped FPS goes from 144 to stutter 30-50. Thank you AMD for nothing. Ok its a beta driver but anyway. I´ll wait one Mantle update further and then thats it. And i dont care that they dont care about loosing me as customer. Please trust me when I say that its Dice's fault concerning mantle problems its their fault because only after 8th july patch is when things went down ,with memory leak issues and crossfire memory leaks. You know guys, threatening posts here about buying Nvidia cards won't get you anywhere. I hate to say this but after many years I am too going for the Green team. There are so many problems AMD needs to deal with and I am tired of them. Besides its Ubisoft and their backing of NVIDIA products is enough for me to change side. It's sad people feel the need to let everyone know they're going to NVIDIA... on a driver release thread. Nobody cares. Stop cluttering up a driver discussion thread and go discuss it somewhere else (or better yet, don't discuss it; stop wasting time by complaining and go get a NVIDIA GPU). As for some driver-related feedback; I've had the screen wake issue with these drivers as well, with ULPS disabled. Also PerformanceTest barely showed any difference between these, 14.9.2 and the OpenCL 2.0 driver for both 2D and 3D tests. Games and 3DMark are probably better indicators of performance testing though. I'm not certain why people seem to want to place the blame with AMD still. Want to know the best way to check if performance issues with Mantle are because of AMD or Dice? How about trying another game; there's quite a few games you could test with. If the stuttering and low-performance persists on other games, then it's probably a safe bet AMD has some work to do. If it's just BF4... then it's obvious Dice has some work to do. Considering the broken mess BF4 launched as, it's pretty obvious where the blame is. Uh, minor tweaks for two games? That's it, really? I am starting to think they don't care about the black screen bug, which is much bigger problem than performance in a random game. Starting to lose faith here. Meanwhile, stuck with 14.4 with my 290.
there are many opinions on this in the Web. Also many "fixes" which dont work. Only Weaponchunks.sb removing or renaming works. But its a high price to pay when doing so. Not only missing sound or similar, also complete Soldier Textures. Not what i would call "fix". Nvidia SLI has no Problems with this. Even running Mantle with single GPU will not fix the leak complete. It makes it much much slower growing, so the chances are good to never paying attention to it as a bug. EA DICE says its AMD fault and AMD says its EA DICE fault. Since July the couldnt fix it both. On reddit i saw last week one AMD CM who could reproduce the Error. After 4 Months. For God Sake. How is this even possible. ok ..enough rant. Set Back to DX11 with stutter Gameplay and waiting for the final. Got to agree with you there. I was wondering why BF4 was using 8.2Gb of memory on my PC. Will have to switch off Mantle. Also in the last year the support for Catalyst Drivers by AMD has taken a serious slide. I thought they were putting more resources into driver support? Seriously thinking of going to the Green Team on my next gfx card upgrade. SORT YOUR **** OUT AMD. NOT GOOD ENOUGH. PERIOD. Yeah really... fix the god damned memory leaks. Do you hear us, AMDMatt? Please tell your people... it's a great product, but it's literally completely unusable. And Direct3D multithreaded drivers are simply better with Nvidia at this point. Good work Mac you beat me to it. AMD Catalyst™ 14.11.1 Beta Driver for Windows® - Call of Duty®: Advanced Warfare and Assassin’s Creed® Unity Performance Driver! •AMD Radeon™ R9 280X/280 may experience a crash when playing Call of Duty®: Advanced Warfare and a video at the same time. If you experience this issue a work around is turning off the video while playing the game. •CrossFire users may experience intermittent flickering in Call of Duty®: Advanced Warfare menus. As a work around if this issue is seen restarting the game may cause the issue to disappear. I find this very funny in a sarcastic way. nVidia launch a brand new WHQL driver for Assassin's Creed and CoD AW, and all you @ AD can come up with is a BETA driver that still have ISSUE with the Crossfire scaling and other issues. Sorry AMD, I'm done with GPU's from you guys. Bye bye 2x R9 290X. Crossfire scaling has been a freaking problem for very long time, and even your WHQL driver has this problem with some games also. I'm done with AMD. Then after they've bought their Nvidia cards, they'll be getting rid of those, and will then have to get a console, as there is no other GPUs to get. 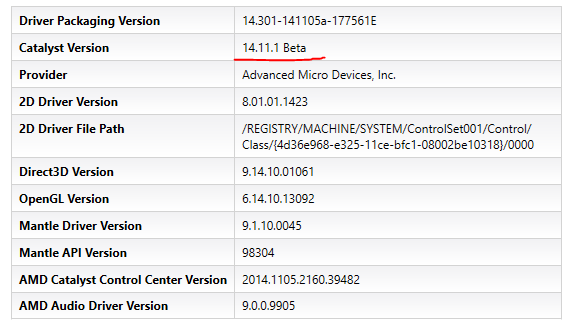 Thats normal, you will be on the 14.11.1 drivers if only the Catalyst Version is being miss-reported, as they don't update the Catalyst Version in their BETA drivers, only their WHQLs, so if you had the 14.4 WHQLs on before these, then the Catalyst Version would show as 14.4. After this drivers my 280X is recognized as 7970Ghz. I went back to 14.7 (as i was using quite some time) its 280X again, strange. Reports of these drivers lowering performance over on Overclockers. Performance dropped a tad for me, anyone else got the same? I've found how to replicate the issue on my end. This was done after starting the PC, so i recommend you restart your PC then follow the steps to try replicate it. Open up Sniper Elite 3 and run a benchmark, note your score. Open up Sniper Elite 3 again and run the benchmark, note your score. For me the first score was 82FPS and all others after that were around ~65FPS at best. Checking GPU-Z shows everything to be normal and that the cards are clocking correctly, they are not throttling at all either. Performance has also dropped in Far Cry 3, with noticable frame rate loss from 60 to more of 40! I don't find this sad when you really take a look at what the driver really brings. There are more issues in this driver than both of them games have been added with. I have been using R9 290X in CFX and some games I really have too disable it because it cause problems. I have testet 3 drivers and 3 Betas for my R9 290X and I'm done. Even WHQL drivers bring CF scaling ISSUES, and that should ring a bell for most users, that AMD have problems solving ISSUES with the driver. Look at the big picture here, nVidia sit on bigger advantage when it comes to stable drivers. I still wouldn't worry if its still not reading that though, as long as everything else reads correctly from these drivers. Think I'll stick with 14.9s for the time being. Maybe catch the next one and hopefully with a decent Dragon Age Inquisition crossfire profile. Driver is crashing after boot in win 8.1 for me, reverted to previous and all is fine again. Weird mine doesn't crash whatsoever. Use DDU to uninstall in safe mode and try again. I had the same and edited the inf's.